Little Giant cylinder pallet. Load bulky gas cylinders for transport by forklift with this heavy-duty steel platform. Thick 7 gauge formed deck is flanked by solid fork pockets that run the length of the unit. Angle iron uprights with angle gussets for strength. 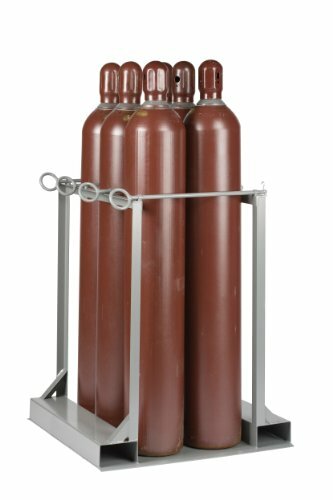 Dividers with loop handles secure the cylinders during transport. 6 cylinder capacity. 9-1/4-inches cylinder diameter. Measures 33-inches width by 41-inches height by 36-inches depth. Vestil AP-4248 Heavy Duty Aluminum Pallet, 4000 lb. Capacity, 42" x 48"